We are so excited to share the new cover. The photo taken by Beatriz Photography was taken in July when we were all together to sign the contract. The aprons of this book reflect the color theme and the spirit of celebration. We are very pleased that Reuben Graham is once again doing the design work on this book. think he once again designed a cover that reflects the essence of what you will find inside. This cookbook is designed to promote the joy and beauty of celebrating life. Whether it be a newborn baby, a significant milestone, camping in the woods, a neighbourhood get-together, a holiday, remembering someone in need or the end of a life well lived, we believe readers will benefit from relevant recipes with personal stories and reflections by the ten of us strewn about the pages of this book. Menu ideas for hosting a bridal shower, planning a family meal or being prepared to enjoy a simple spontaneous dessert will inspire the novice as well as the experienced cook. Join us in celebrating what matters most through the seasons of life. I think we'd love to give away another book. That purple apron is gorgeous. I think this Christmas I might make some aprons that are functional yet pretty. I'm pretty sure I need one or two myself. =) gorgeous book! It's a lovely cover--can't wait to see what's inside. What a beautiful cover. Congratulations to all of you. Love the cover. Looking forward to the new release. Beautiful! Count me in ti win! Oh I can't wait to buy a few for gifts once it's out! Congratulations! Beautiful cover! I look forward to your new book. Congratulations. It looks lovely. When will it be available to pre-order? So excited for your new book ( STUNNING DESIGN AND COLORS )and what this book will offer to all your readers. Most of all I would like to thank God for all you ladies for what your dream has done. Can't wait until this book is in my kitchen. Love the cover of the book! What a beautiful cover!! Congrats and thanks ladies! Beautiful cover...would love to have a book!! I'm all up for winning your beautiful new book! Absolutely beautiful! The colors are breathtaking and just look like a celebration. I have your last cookbook and can't wait to have another. Best wishes. Nothing I would like more thatn to WIN!! Nice cover!! Beautiful cover, I know the book will be fabulous! Wonderful! I can hardly wait. Love the cover! I am looking forward to the new book and how many memories reading and using it will bring back. Awesome job ladies! Brings the spirit of joy, good food, family and friends that such celebrations entail! I love the cover! The first book was a walk down memory lane, I can't wait to see where this one takes me. It looks lovely, Ladies! Can't wait!! Love the cover and love your recipes! Would be thrilled to win a copy. That is a beautiful cover. I can hardly wait to read this one. I love cookbooks that read like warm comfy books. ..
What a beautiful cover! Just a peek to what we have to look forward to...so looking forward to seeing the new book! 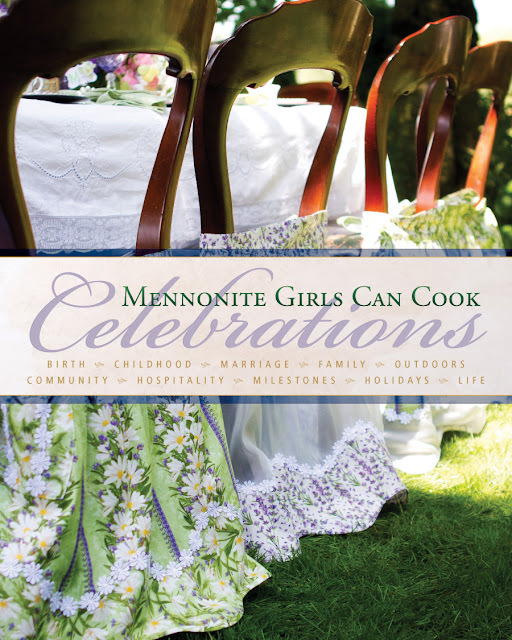 You "Mennonite Girls" have so many wonderful recipes and ideas to offer! Beautiful picture! Looking forward to the new release! Beautiful cover--I'm anxious to see what's inside! The cover is so warm and inviting! Love it! Thank you for all your divine recipes as well! What a beautiful cover, and I'm so happy to see aprons are coming back into style. They can be so beautiful and functional too, and of course they can be fun also. Thank you so much for taking the time to make such a sure to be wonderful cookbook. I love the new look on your blog, and the cover is beautiful. Would love to have a copy! I am a regular follower of your blog, and use quite a few of the recipes. I really enjoyed your first book, in fact I was gifted with 2, and am looking forward to seeing Celebrations. Beautiful cover! We enjoyed an amazing trip to British Columbia this summer. Love your recipes. It's beautiful!! Can't wait to see the whole thing! that is beautiful! Love the design and the color scheme. this is definitely going to join the first one on our shelf! Looking forwar to this book. Love your recipes and ideas. Check your site nearly every day. Absolutely beautiful outside - and I am sure it is the same inside! What a Beautiful Cover I know the inside will be just a beautiful, I can hardly wait for it to come out. Thank you for sharing. This is the first time I've commented here....and it's because the book cover is simply lovely and I wanted to wish you congratulations and thanks for such a lovely blog. SO beautiful. I gave your first book to my family members last Christmas... when this one is available it might also make an appearance under the tree! Wonderful...need to get your cookbooks!! I get some of your recipes on Facebook, but it would be great to have the cookbooks!! I like the way the photographer went through the back of the chairs to the table! It looks like a celebration. What a different view!! Awesome!! I have so enjoyed your website and FB blogs. Beautiful cover! I look forward to seeing the inside. Hi,this is my first time commenting but I have followed your blog for a few years and love , love ,love all the great recipes. I have been inspired to try canning as well as taking the plunge and learning to make bread from scratch - it's not really that daunting when you have lots of detailed steps:-) I have also put alot of friends and family onto your blog and book and we feel it's one of the best out there. Keep up the great work! And congratulations on the new book - love the beautiful cover! The cover is beautiful ,it just makes me want to peak inside. I've tried many of your recipes and loved each and everyone . Your website is always one of my first stops every day. The recipe of the day or the prayer is equally welcome. Your ministry of using your earnings to do good shows just what women of good faith can do in this world. Congratulations on the new book, it looks beautiful! What a beautiful cover ... can't wait to see the rest! Just lovely,count me in to win as well. Oh my, that cover conjures up celebration in a big way! Lovely! I can't wait to see (and use) this book! Congratulations on the new book ladies! The cover is gorgeous and surely a promise of whats to come inside. I love your blog, it is truly one of the best out there I think :) Would love to get the new book as I love the first one so much. Beautiful cover. I look to your site often to find recipes and I'm never disappointed. What a lovely cover, I look forward to it's debut! Congratulations to all of you on your new book. The cover is so pretty. One just gets the feeling that a memorable celebration will take place at that beautiful table. Congratulations!! I love the cover.... it's beautiful! I am so excited for all you wonderful girls and will anxiously await the arrival of the new book! It's a gorgeous cover! Bea is certainly blessed with the gift of a photographer's eye! Congratulations, ladies! The new book looks great, congratulations! Absolutely LOVED the first book - can't wait till the second one comes out - definitely one to add to my growing collection. Your first book is such a hit in our family. Can't wait to see what is inside that beautiful cover. It's beautiful! Congratulations to you all! Beautiful book and can't wait to see what's inside.I love your first cookbook and use it often, as well as looking up recipes on your computer site. Gorgeous!! I'm so proud to tell people I "know" you girls!! Lovely book cover, love the theme of celebration!! i would love to present this cookbook to my daughter who is getting married 12/12/12! What a beautiful cover and in my colours too. Even my china pattern! Can't wait to add your new book to my shelf and remember how to celebrate again...life has been full of troubles......God is good! Looking forward to another great book, a celebration, a joy of sharing with others! Wow look at all the comments. That is so great to see such wonderful support. I love the book and really appreciate your website. I have you on facebook and very often check out your postings. Thanks so much for sharing your love for good food and fellowship. Blessings to you as you bless others. Sure can tell by comment,s all want to win .. creature,s of habit .. I look daily as I can at your recipes ,,and print off which I like but I would just like to know where a person can buy them In Saskatcewan ,, we live in the wayyyyyyyyyyyyyy north ,, and rarley go to any big city ..
You can always order your book online at Menno Media's website or at Amazon.ca. You'll have the delight of getting it delivered right to your door. Wow have you ladies ever accomplished amazing things over the years!! I have followed you from the beginning when blogging was a new idea! How wonderful to use your God given abilities to take a simple idea so far!! I would love to win a copy if your new book!! Congratulations!! Love, love your blog and I would love to have a copy of your book! Love your website. It's the first thing I look at when I turn on my computer. Haven't tried any recipe that we didn't like. Congratulations on the new cookbook and the cover is just wonderful. Lovely idea using the aprons. I'm in it to win it! How beautiful! I can't wait for the book! Thank you again for all your recipes. You have become my 'go to' for delicious meal ideas for my family! Totally looking forward to adding this latest book to my collection! Thank you for sharing a wonderful post. I have a special message for you posted today, hope you like. What a lovely cover--I can see the continuity with your first book, the photograph is celebrative and warm (yay for the great weather in July! ), and I like the way the different occasions are listed on the cover too. I look forward to seeing the book in print! This looks like a creative recipe book -- I love it! Lovely cover design and lovely aprons. I often wear a pretty apron when I'm cooking or baking; one of my favorite memories is a comment that a friend's little boy made one time about me when I came to the door wearing an apron: "She looks like a real mother." Wow, what a beautiful cover! I can hardly wait till the book is available! I really enjoy entertaining and so this new book will have a welcome spot in my recipe shelf! I've never been this excited about the upcoming release of a cookbook! Your recipes take me back to my childhood happy place. My family is so glad I found your website! Gorgeous cover .... can't wait to see your latest recipes. So pretty... looking forward to seeing the rest of it! Congratulations on your new book. I visit your site often, but find cup measurements difficult for ingredients such as butter. Is it melted, or can you tell me a weight equivelent. Your recipes are so different to many of those found in the UK I would love to try more of your delicious offerings. Thank you and best wishes to you all. Hi Sals View ... here is a UK conversion chart http://www.recipes4us.co.uk/conversion_charts.htm You could print out a cup/weight chart and just stick it into your recipe book for handy reference. If butter is to be melted it would be stated, otherwise it is used in its solid state -- usually the way butter is added in the recipe is noted in the method. The cover is beautiful - it makes me want to be there at that table! I would love to win the book! Love the cover photo you all chose to use. Can't wait to see the New Cookbook for myself. Love alllllllllll the recipes you gals post. Looking forward to all the new stories and recipes! Luv the cover! Even recognize the chairs as my SIL who happens to be a MGCC. Great theme. Just beautiful.. Great choice for this book! I check out your website everyday....it's marked in my favorites and is pretty much the first thing I do. Have tried many recipes and continue to make them over and over. The picture in your 1st book taken in the Delmonte Studio in Abbotsford was the same place - and almost same seating arrangement - that our family had done way back in about 1958. I had to look twice to see that it wasn't our family. I have given the book as gifts and am looking forward to the new one. Great cover and love the aprons idean! I love your new cover!! It looks so fresh and inviting. Your blog is so fresh and inviting also. Your blog is in my favorites at the top! I love to read it every time I get on the computer. I love your recipes. I will be looking forward to getting your new cook book for myself. It is a very classy and gorgeous cover...and I love the celebrations theme! It looks very promising and I shall be awaiting its release for purchase. Beautiful cover! I'm looking forward to the release of your new book. Best wishes for many more cookbooks and blog posts! What a beautiful cover! I'm sure it will be a good reflection of the contents. Looking forward to purchasing another, or two or three. Wow! What a beautiful book! The book is officially on my wishlist. What a beautiful cover. Great cover! I really enjoy your first cookbook and can't wait for the next one. Love the cover...can't wait to check out the new book! What a beautiful book! It will be left out, ready to use and when not in use the beauty of the cover will grace my kitchen!! What a lovely cover. Love all those pretty aprons! Very festive! Hi Barbara ! so nice to see you in our comments -- all the way from the deep south! Mennonite cooking with a Southern drawl ! that would make it perfect ! smile. The cover is beautiful!!! So excited to purchase this new book! I cannot wait for this book. I love the spirit of giving that pervades this site. So excited to see what's inside! This book sounds amazing! I purchased your last book for my daughter and daughter-in-laws - I especially like the words written by each one of you wonderful women - you all speak such words of wisdom about your faith and your family. Blessings to you all. A lovely cover; can't wait to see the finished product. Beautiful colors in the photograph! Thanks for the giveaway! This is so pretty and another cookbook! I love the first one. wonderful recipes - they are all winners. You are ten amazing women. Celebrations! That says it all...... Congratulations on your beautiful cover and book. Beautiful cover and a wonderful idea for a collection of recipes!!! I look forward to having this keepsake in my collection. So excited to see what your next book will hold - congratulations on your hard work in putting this one out. Wishing you all the best! I'm so happy for you and proud of your achievements! You've always been so sweet to share your recipes on your blog! Your cookbooks are wonderful! Hugs! I love the cover and love your recipes and devotions that help us all to focus on our faith and families! Awesome cover! Can't wait to see what's inside! Truly a lovely design. Keep up the great work. There are many Mennonite girls out here cooking up family favorites - I love seeing the recipes carrying on from generation to generation. It is a very stylish cookbook cover and I'm sure it will be full of the most wonderful recipes! I can't wait to get a copy! I look forward to checking this blog everyday! I love it and am looking forward to the new book! The new cookbook cover looks amazing, and I would love to have the second edition to go with the first one and also the fact that 1 of the editors - Judy - is my cousin, so I am very vocal about this cookbook and convince people to get it. I love the cover of the book! Really looking forward to the release! What an amazing ministry you have. I am looking forward to seeing the new book and anticipate buying several for gifts. Thank you for all work that you do to keep those Mennonite recipes going. ohhhh it reminds me of Alice in Wonderland! I know lots of work went into this ladies, it's going to be totally worth it! Looks great - proud of you grandma!!! Congratulations on a beautiful new cookbook! Your work makes me proud of my Mennonite Heritage and the values you demonstrate. Thank you. And I am especially proud of my cousin Judy! that cover is so beautiful! Just like the meals and devotions on your site. I'm so excited there is a book #2 coming out! Love it!!!!!!! Congratulations MGCC gals!!! The book cover looks fantastic and I know once we can actually turn over the cover the inside will be just as amazing!!! Looking forward to reading it. God Bless each one of you! What a gorgeous book! I cannot wait to get this book! Oh lala! Can't wait to celebrate the day it comes out! What a great ministry these books are creating. God bless you all. I can hardly wait to get this book. What a beautiful cover and I know the inside will be as beautiful as the ladies that wrote it. Congratulations. Just lovely! Hoping I win! A wonderful new book! I've baught your first book,and I read it, each word. I love it. Wouldd love the second book to go with my first! What special memories Celebration will add to those special days when families and friends come together. Congratulations on your new book! How special that is...I so cannot wait until next year? Is there a way to speed it up..lol. Beautiful! And it will taste as good as it looks. A lovely cover. Can't wait for the book launch. Am I allowed to comment at this late hour? Looking forward to book #2. I Love your website, visit it often for meal ideas, would really love a book! I'll be looking to puchase your book!!!! Beautiful! Thanks for the giveaway chance. I really love your recipes and Sunday's Bread for the Journey. A beautiful bookcover. I am very much looking forward to your new book! Please enter me in you drawing. Blessings. Always recommending your website! You are doing a great job! Congratulations on your new book! What a great idea of decorating the chair backs with the aprons tied on! Brilliant! Will one of the MGCC gals be making fancy schmancy aprons for purchase also? Wow, beautiful cover design... Can't wait for the actual book. I'm going to place an order today, then if I win a book I will have a gift to pass on! Looks beautiful! I'd love to win. What a beautiful book cover! Thank you so much for all you do. Your site is one I visit everyday. The cover is just beautiful! Congrats! That looks gorgous, I'm looking forward to it. What an inviting cover! It begs you to come sit and have tea in the garden, on a sunny afternoon. Pretty aprons too.I'm a great fan of aprons & love that your second book carries over the theme from your first book. As everyone else, I'm looking forward to the release date of you new book. I know from having your first cook book, it'll be a winner! Such a beautiful cover, I love the beautiful aprons, what a nice tough. The cover is wonderful and the aprons are so lovely. My family is Mennonite and we treasure all our aprons that we make and exchange. I can't wait until your new book comes out. Looks great! Can't wait until the new book comes out! Lovely cover! Can hardly wait for the Real Thing! I really enjoy your recipes and especially the uplifting words that go with them. If the inside of the cookbook is as outstanding as the cover, it should be a great book. I have really enjoyed this blog. Almost every recipe that I have tried has turned out. I have also enjoyed your first cookbook. Keep up the great work. I'm looking forward to Celebrations. Congratulations on the new book. I look forward to seeing it. I have your first one and it's terrific. What a beautiful cover! Your recipes are so wonderful, and I love the theme of celebrating life's events. I look forward to reading all your stories in the book, and trying the yummy recipes included. Beautiful cover! Can't wait to see it in person. Congratulations~~~it looks like another beautiful filled with wonder and inspiration~~can't wait! LOVE the beautiful cover. How creative! Can't wait to see the new recipes and inspiration! I gave your first book to all of my girls (daughters and DILs) for Xmas, to help them keep our Mennonite heritage alive, but I don't have one myself. Would love to have this one. Looking forward to all of the special occasion menus to be in it. And those gorgeous aprons! Makes me want to make frilly aprons for the girls for Xmas, instead of PJs! Yah - simply can't wait to own this book! !